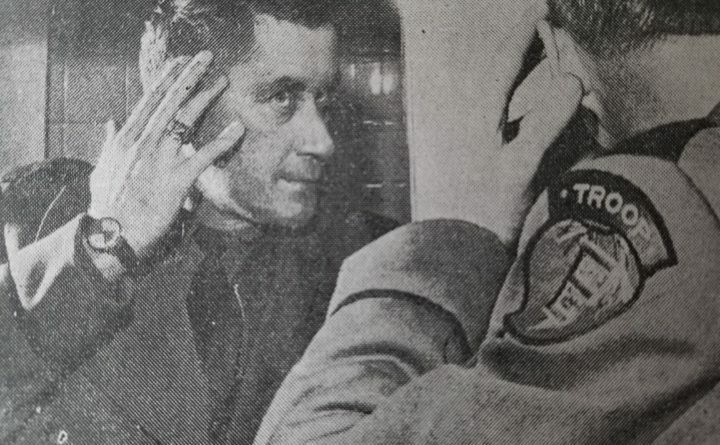 Maine State Police Trooper Tom McCrea checks a scalp wound following a shootout inside Brewer's police station on Feb. 21, 1965. 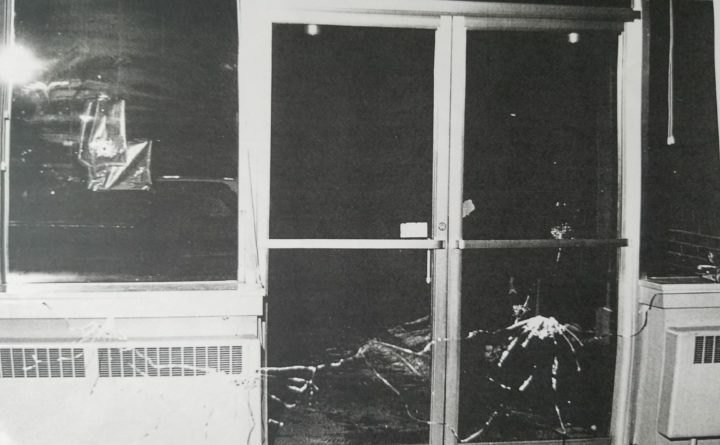 The lobby of the former Brewer police station on Main Street following an early morning shootout on Feb. 21, 1965. A Maine State Police trooper leaned across the desk to top off a dispatcher’s coffee as they cracked jokes and chatted about weather and their families. It was a semiregular early-morning ritual they repeated inside the eerily quiet Brewer police station, while most everyone else in Bangor and Brewer was sound asleep. A few laughs and a few jolts of caffeine helped revive them during the dullest part of the shift. It was just before 1 a.m. Sunday, Feb. 21, 1965. Amid their banter, they noticed with vague interest a taxi pulling up out front. The trooper moved to return to his seat. Then the front window exploded. Shards of glass rained into the lobby, shattering and sliding across the floor. More explosions followed, and more .308-caliber bullets punched neat holes into the glass of the police station’s front door. A man carrying a hunting rifle advanced toward the door. The police department and the only two people inside were under siege. The trooper was my grandfather, Tom McCrea. When the first shots rang out, the dispatcher, Lynwood Ashton, bolted for cover in an adjoining room. McCrea drew his revolver and ran for the same room, taking cover behind a low partition wall. Another shot, and the glass above that partition shattered and showered down on them. Ashton scrambled for the police chief’s office and called for help, while McCrea watched the attacker pace back and forth in the reflection of another plate glass window. The man shouted that he wanted to kill someone from Brewer PD. McCrea shouted back that he couldn’t let him do that. The stranger demanded McCrea toss away his gun. McCrea shouted for him to put down his rifle. The answer came in another gunshot, then the attacker started closing in for a better shot, firing another round as he approached. McCrea leaned around the corner and fired five quick shots from his revolver. One hit the attacker in the arm, turning him around, and one of the following shots struck him in the back. The man crumpled to the ground, and the shootout ended as abruptly as it started. Moments later, police from Brewer, Bangor, the state police barracks in Orono, and sheriff’s deputies flooded the scene. An ambulance rushed the shooter, William Igoe, to Eastern Maine General Hospital in Bangor. Later, the shattered glass would be swept off the floor and the blood mopped up. After things quieted down, McCrea took a moment to look in a mirror. He touched the left side of his scalp, just above his ear, and his fingers came away with blood. One of the bullets had grazed his scalp. He needed nine stitches to close the wound. Igoe, a 28-year-old gas station attendant at Dow Air Force Base, had been on what newspapers and police called a “rampage” since the early morning hours. It started across the river in Bangor around 12:40 a.m., when two officers checking on a call reported possible gunshots. When the officers got out of the cruiser to look around, Igoe opened fire from behind a tree down the street, sending them back to their cruiser for cover. Igoe managed to get away while the officers were backing off and calling in backup. He found a cab nearby, pointed his rifle at the driver, and told him to drive him to the Brewer police station. “That rifle looked like something you could drive a truck through. It scared me more than anything in my life,” the driver later told the Bangor Daily News. Before Igoe exited the cab, he asked the driver if he had any kids. “Six,” the driver said. Igoe got out, paid his fare — 65 cents — and then turned to shoot at the police station, starting the siege. Investigators told reporters that Igoe had a “toxic reaction to alcohol,” sparking the morning’s chaos. Later that morning, my father, Marty McCrea, rolled out of bed, walked into the living room and found my grandfather sipping coffee in the living room. He wore a long, narrow bandage on the side of his head. “I got shot at Brewer PD,” my grandfather said nonchalantly, taking another sip of coffee. My dad doesn’t exactly remember how he responded, aside from the awkward chuckle of a 6-year-old who didn’t quite know how to react to that news. “It was just like he’d gone out to cover a traffic accident, like it wasn’t a big deal,” my dad said later, recalling what he remembered from that morning. The gravity of what happened didn’t hit home until later. Commendations flooded in in the following weeks and months. Newspapers across New England detailed the duel. Maine Rep. Wayne P. Libhart, representing Brewer, sponsored an order recognizing McCrea for his “extraordinary courage,” which likely saved the life of an unarmed dispatcher. State police cited him for bravery and being wounded in the line of duty. The next year, he was named “New England’s Outstanding Police Officer of 1965,” and the Brewer VFW Post and Chamber of Commerce also handed out awards. But that’s not the end of the story. It’s just the start of the part that my family loves to tell, the part that says a lot about my grandfather. Igoe recovered from his injuries and spent the next 7½ years in prison. After his release, he built a career as a master electrician. He stayed out of trouble, raised his family and ran his business for the rest of his life. He and his wife, his high school sweetheart, stayed together despite his prison term, and continued to raise their family after he got out. The Igoes had five children and multiple grandchildren. Tom McCrea retired from Maine State Police in 1977, but went on to work for the Penobscot County Sheriff’s Department from 1985 to 1995, where he served as the jail administrator. At some point after Igoe’s release, he and my grandfather ran into each other. We aren’t sure exactly how the conversation went, but the two apparently hit it off. While McCrea was leading the jail, he brought Igoe back, not as an inmate, but as a contractor to do some electrical work on the historic facility. Igoe gladly obliged. Later, they’d meet up on occasion for a round of golf, and stopped to chat whenever they ran into each other around town. My grandfather died of heart disease in 1998, and my family held annual law enforcement golf tournaments for several years after to raise money for the cardiovascular center at Eastern Maine Medical Center. Igoe attended my grandfather’s wake. He spoke with my dad, and said he felt “uneasy” about being there because he’d overheard some comments from former law enforcement officers in the room. My dad dismissed his concerns, thanked him for coming, and said my grandfather would have wanted him there. I tried to reach several of Igoe’s family members to see what they remembered about his friendship with my grandfather but never heard back. Igoe died on the last day of 2016, according to his obituary. My father attended the wake, as my grandfather would have had he still been around.